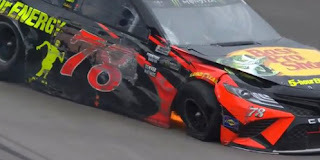 Martin Truex, Jr. picked up the 7th last-place finish of his Monster Energy NASCAR Cup Series career in Sunday’s O’Reilly Auto Parts 500 at the Texas Motor Speedway when his #78 Bass Pro Shops / 5-hour Energy Toyota was involved in a hard single-car accident after 80 of 334 laps. The finish, which came in Truex’s 448th start, was his first in a Cup Series race since November 13, 2016 at Phoenix, 44 races ago. In the Cup Series last-place rankings, it’s the 22nd for car #78, the 147th for Toyota, and the 562nd by reason of a crash. Across NASCAR’s top three series, it’s the 30th for the #78, the 295th for Toyota, and the 1,132nd by reason of a crash. Truex’s rise since he joined Furniture Row Racing in 2014 has been well-documented. His debut with the team was a last-place run in the Daytona 500, where his backup car lost the engine after 30 laps. A year later, he ended a nearly three-year winless streak with a win at Pocono, then made the final four at Homestead. A switch to Toyota brought four wins and another championship run in 2016, but another blown engine at Talladega left him an also-ran. That all changed last year, when he capitalized on the new stage racing format to score eight wins and the first Monster Energy Cup. Truex arrived in Texas with a streak of five consecutive top-five finishes, including a dominant victory in Fontana. He ran 10th-fastest in Friday’s opening practice, then ran 6th in Round 1 of qualifying with a lap of 195.979mph (27.554 seconds), which became his official starting spot when rain washed out the final two rounds. He then ran 11th in Saturday’s morning practice then improved to 5th in Happy Hour. Lining up last on the grid was Reed Sorenson, back in Premium Motorsports’ “open team,” the #55 Chevrolet (originally reported to be a Toyota) for the first time since Fontana. Sorenson was the only driver to not turn a lap in Round 1 of qualifying, but with just 37 cars for 40 spots, he still made the show. As usual, there were some position changes during the pace laps. The first time by, David Ragan slowed in his #38 1000Bulbs.com Ford, and on the second pace lap, Ross Chastain stopped his #15 LowT Center Chevrolet on the apron of Turn 1. Both cars rejoined the field in the 29th and 31st spots, respectively. With one lap to green, the four drivers who incurred pre-race penalties went to the back. Heading through Turn 3, Kyle Larson pulled his #42 Credit One Bank Chevrolet to the outside, sent back after his car failed inspection three times. On the backstretch, Matt DiBenedetto fell back in his #32 Can-Am / Wholey Ford for a transmission change, joining William Byron’s #24 Liberty University Chevrolet, which had a new engine. Also sent to the rear was Ricky Stenhouse, Jr., who for the third time in four races was sent to a backup car following a wreck in practice. Coming to the line, Sorenson had dropped back once more, holding down 37th with Byron and DiBenedetto forming the row in front of him. On the first lap, Sorenson held down last, but was keeping pace with William Byron as he followed the #24 through the first two corners. To Byron’s outside was Landon Cassill, who lined up 35th in StarCom Racing’s #00 USFRA.org Chevrolet. By the completion of the first lap, Sorenson had passed Cassill, and was now working over the #51 Rick Ware Racing Chevrolet of Harrison Rhodes. Coming to the completion of Lap 2, Cassill was still in last when he suddenly steered the car down pit road, avoiding a wreck unfolding off Turn 4. In trouble was 16th-place starter Alex Bowman, who got loose on the apron and spun in the middle of the pack, leaving several drivers with damage. As Bowman’s #88 Nationwide Insurance Chevrolet spun to the outside, Paul Menard was slowing down in his #21 Quick Lane Tire & Auto Center Ford and veering to the left. This closed the door on an approaching Daniel Suarez in the #19 Stanley “Racing for a Miracle” Toyota. Suarez’s left-front slammed into the right-rear of Menard, leaving both drivers with heavy damage. Bowman, Suarez, and Menard joined Austin Dillon, who suffered front valence damage, to pit under the yellow. Under the ensuing caution, Bowman took last from Cassill and was the first driver to be lapped by the leaders. Bowman made it back on track with the rest of the group, trying to beat NASCAR’s six-minute “Crash Clock.” On Lap 5, Daniel Suarez’s team was taking extra time repairing the damaged left-front of the #19, costing them a lap of their own. When Bowman pulled into the pits that time by, stopping two stalls in front of Suarez, the #19 fell to last place. On the Lap 7 restart, Suarez was just coming off pit road, now three laps behind. Much like Kevin Harvick at Fontana, he waited until the whole field had exited Turns 1 and 2 and pulled onto the track by himself, about a half-lap behind. Suarez was still not up to speed, and on Lap 18 lost a fourth circuit to race leader Kevin Harvick, who sped by to his inside off Turn 2. The Joe Gibbs Racing team called Suarez back to pit road on Lap 22, and didn’t return until Lap 35, by which point he was 19 circuits behind. He then lost a 20th lap as he got up to speed, then returned to pit road for a green-flag tail end penalty for too many crew members over the wall. Suarez stopped yet again on Lap 51, at which point he was 22 laps down to the leaders. While Suarez was once again sitting on pit road, Alex Bowman pulled his damaged #88 behind the wall, the first driver on Sunday to do so. On Lap 59, Bowman was 12 laps down, 17 laps ahead of Suarez. Suarez was the first of the two to return to action, doing so on the 67th go-round, then made another pass-through penalty for too many men over the wall the next time by. At this point, Suarez was now 39 laps down, putting him in position for car #19’s first last-place finish since July 14, 2013. Martin Truex, Jr., meanwhile, was looking to turn adversity into an advantage. He’d been forced to make an unscheduled stop, but had cycled back up to the runner-up position on Lap 80, poised for a good finish when Stage 1 ended five laps later. But coming off the fourth turn, the right-front tire went down without warning, steering the #78 hard into the outside wall. As the caution flew, allowing Kevin Harvick to take the Stage 1 win uncontested, Truex climbed from his car unhurt. His Toyota was towed behind the wall, then loaded up, done for the afternoon. By Lap 82, during the Truex caution, Alex Bowman had returned from the garage area. He was now just seven laps from Suarez passing him for 36th, dropping the #88 to last. Instead, with both Bowman and Suarez running, the two gradually closed on the retired Truex. On Lap 88, Truex’s car was pulled off the RaceView app. On Lap 112, Bowman passed Truex. And on Lap 121, Suarez dropped Truex to last. The rest of the Bottom Five proved to be an “all-star” affair as several other top drivers found themselves involved in accidents. Finishing 36th was Kyle Larson, who like Truex was running in the Top Five when he blew a right-front and slammed the Turn 1 wall. His car was still smoldering as it was towed to the garage. The remaining three spots went to Jimmie Johnson, Denny Hamlin, and Brad Keselowski, who tangled in Turns 3 and 4 on Lap 176 after Hamlin ran up on a slowing Aric Almirola. Like Truex, the group gradually fell down the rankings below the lapped Bowman and Suarez, who finished 28th and 29th, respectively. With so many big names struggling, other small teams enjoyed strong runs. Top of the list was Darrell Wallace, Jr., who came home 8th, his best finish since his runner-up showing in the Daytona 500. Michael McDowell recovered from his disappointing engine failure at Las Vegas to finish 14th, his best run since he was 9th in the 500. Behind McDowell were Chris Buescher, Matt DiBenedetto, Kasey Kahne (driving for Leavine Family Racing with heavy left-front damage from a blown tire), Ross Chastain, Cole Whitt, and Gray Gaulding, who all left Texas with top-twenty finishes. Landon Cassill and Harrison Rhodes, 21st and 22nd, came within one and three laps of challenging this group, but still left with their best finishes of the year. Prior to Sunday, neither driver had finished better than 33rd with Cassill finishing last in his Martinsville season debut. *This marked the first last-place finish at Texas for both Truex and car #78. It’s Truex’s fourth last-place finish with Furniture Row Racing.